Although summer is winding down, we’re still drinking plenty of iced tea. And so is everyone else, judging by our recent project for B.W. 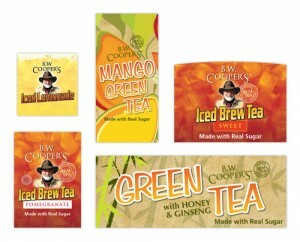 Cooper’s Iced Brew Teas. We recently designed unique labels for five of Cooper’s iced brew teas. These teas are served nationally in foodservice operations and include the first USDA- certified organic bag-in-box iced tea. The teas are also a recommended item at 7-Eleven and other convenience stores. Because the teas are so popular and found in so many different fountain drink dispensers and serving containers, we designed seven different label sizes for each of the five beverages. Enjoy a glass of Cooper Tea today!